Having a shredder in your office is your first line of defense against identity theft and the best way to guarantee the save disposal of confidential information. Businesses of all sizes are affected by federal legislation which hold them responsible of taking reasonable measures to protect against unauthorized access to confidential information.When you invest in a shredder you are taking one of the most essential steps towards protecting your business. Shredding Machines provide the most convenient and simple to use option for disposing sensitive and top-secret office documents. We offer a huge selection of shredders, from deskside shredders to high capacity shredders, so your business is sure to find a machine to meet their needs. All our shredders ship FREE of charge and come with a one year warranty on parts & labor! Find the right shredder for your office needs! 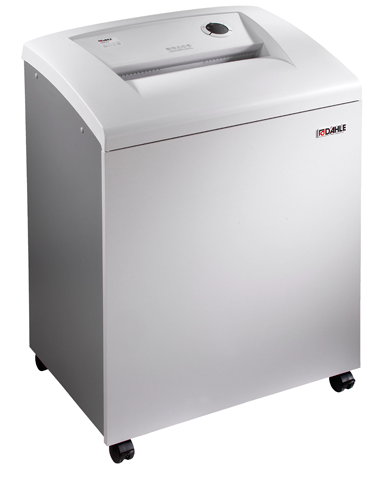 Need help selecting the right shredder for your business needs? 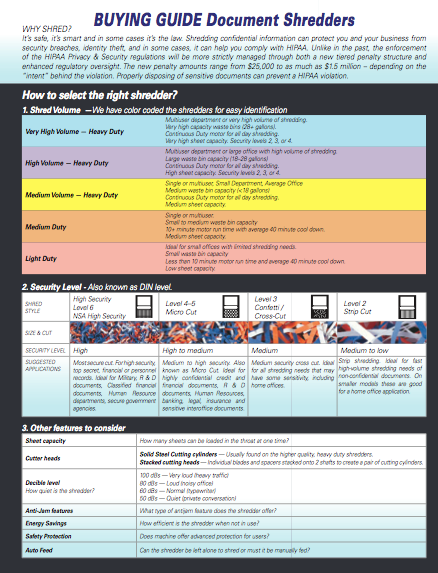 ]The Dahle Shredder Selection Guide can help make the best decision for you. There are many things to consider when purchasing a paper shredder and all the variables can seem overwhelming. After all, the privacy of your information is at stake so it’s important to make the right selection. With sheet capacity, motor size and waste volume to consider, the following questions will help you narrow down your selection to only a few models. Questions about Shredders? We would be glad to help!